My eBooks and Paperbacks are now sold on Kindle, as well as Amazon. My name is John Hartig. I am an author within the Niagara Region. I am also a photographer of Niagara Scenery, and a web designer. Yes, I am retired, but my three passions keep me busy. I am blessed and still sharp enough to be able to do writing, web design and photography as a septuagenarian. Since I am an insomniac, I do my scenery photography during the daytime, and my writing at midnight. Hey, who needs sleep? Several years ago I went to night school at Mohawk College to learn how to do web design from scratch, which means scripting, mostly HTML. I don't use templates. My sites are cell-phone friendly. I host the sites myself through my godaddy account. You can Google Niagara Scenery, John Hartig Photos, Niagara Author - John Hartig, Vineland Web Design, or Niagara Author. I'm not crazy about Facebook. I prefer a direct how-do-you-do from people who are interested in my novels and my scenery pictures..
Love and Faith Trilogy: Book One asks the question: "What Honor is there in an Honor Killing?" 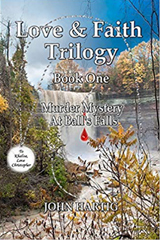 The novel starts with Ahmad, the brother, killing his own sister, Khalisa, in the woods at Ball's Falls. Father, mother and the brother all agree that Khalisa must die because she is willfully dating a white "infidel", Christopher Unger. This, in their minds, is a relationship which is not on the true path of Allah. Ahmad gets away with the murder for nearly 2 years. The younger daughter, Fahm, doesn't know that her own brother had killed her older sister. But a silver necklace, found at the scene of the murder, leads to Ahmad, as the killer. When the police close in, the parents give Ahmad money to escape and join ISIS. They go on trial and are imprisoned. Detective Ed Spencer and Fahm fall in love after the trial. The parents disown Fahm. The brother is still free and plans to come back to Canada with a false passport to do what? 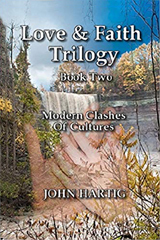 Love and Faith Trilogy: Book Two explores "Modern Clashes of Cultures". It sees Ahmad fully trained as an ISIS fighter after a year of living in Syria. While in Syria he gets a new name, Galip. He is given the task of beheading somebody which is videotaped and then put on the internet. Fahm, recognizes her brother despite the niqab he wears. It's by the eyes. Ahmad receives a new mission with a new passport under the name of "Ossi". He is told to come back to Canada to bomb the subway in Toronto. The plan is foiled. "Ossi" goes to plan B which is to locate Fahm in Hamilton, and there kill her. Detective Spencer saves the day. Meanwhile, in the larger picture, Canada experiences tragedies as a nation. Patrice Vincent, a soldier, is killed by a car driven by an ISIS terrorist in Quebec, and Corporal Nathan Cirillo is shot dead on Parliament Hill. “Islamophobia” grows noticeably in Canada and hate videos are uploaded to Youtube. Symon makes one more trek with his camera to Ball’s Falls for more scenery photographs while he is still able to do this before cancer claims his life. Wally writes a stirring poem included in the end of Book Two. 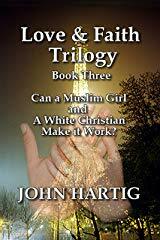 If you start out with Book One, don't forget to continue with "Modern Clashes of Cultures" in Book Two and then, the question of "Can a Muslim Girl and a White Infidel Make it Work?" in Book Three. The books are full of facts and imagination, full of danger and hope. An enjoyable read. 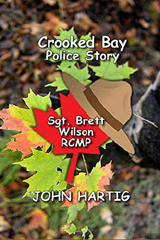 Crooked Bay Police Story depicts a quiet little town on the west coast of Newfoundland. It has a bunch of little houses, two churches, "The Reserve" and an RCMP outpost. Since the Lucky Strike Mining Company found gold north-east of town, Crooked Bay has been going through an economic boom, bringing in lots of people looking for work. Sgt. 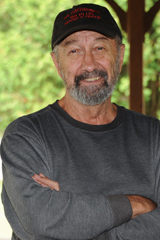 Brett Wilson thinks that an economic boom is not necessarily a good thing for a small town. The police department, manned by three officers, has its hands full already, trying to keep up with abuse at the seniors' home, poachers on The Reserve, teenage drunkenness, a car theft and the usual break and entry. What they don't need now is the town's first murder! A teenager, recently released from juvenile detention, is accused...except he did not do it! The real killer hides behind a mask of status and respectability. How will the RCMP bring him to justice? Who Killed Jean-Marie Leclair? The year is 1764. Jean-Marie Leclair is found stabbed to death right in front of his house. The crime was never solved and no one was ever arrested. What are the secrets in this murder mystery which were never uncovered? 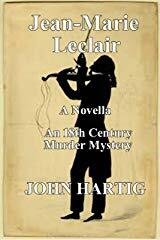 Jean-Marie Leclair was an accomplished violinist of the Baroque period. Also a composer. He founded the French School of Violin. The culprit could have been the nephew who was a mediocre violinist wanting his uncle to promote him before King Louis XV of France. It could also have been the ex-wife, Louise Roussel, who made money by publishing Lecalir's manuscripts. So, who dun it? Read and find out. 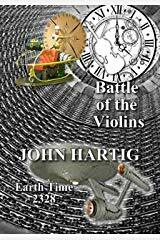 Battle of the Violins Captain James T. Kirk of the Starship Enterprise is given a mission. Bring back to the future 6 of the best violinists in history to see who is the best of the best in a fiddle jamboree to be held at the Hollywood Bowl in the year 2328. Engineer Scotty is none to happy about the mission. This will strain his "bairns" his beloved engines because it takes immense energy to bulldoze the Enterprise through the continuum of time and space. That is why they have to make a pit-stop in 1901 at the house in England of H.G. Wells who has secreted a Time Machine in his basement of a smaller dimension. One of the star performers is, of course, Jean-Marie Leclair, that is before he was murdered, so he can show off his prowess to see if it was equal to his renowned reputation. Among the top 6, who will win the best of the best? 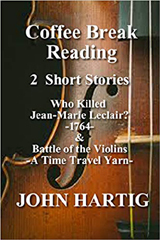 Coffee Break Reading 2 Short Stories: The first, "Who Killed Jean-Marie Leclair? ", one of the great violinists and composers of the 18th century, stabbed to death in 1764. It could have been the nephew. It could have been the ex-wife. The answer lies in your reading the book! The second story is about time travel. Captain James T. Kirk of the Starship Enterprise is given a mission. Bring back to the future 6 of the best violinists in history to see who is the best of the best in a fiddle jamboree to be held at the Hollywood Bowl in the year 2328. Engineer Scotty is none to happy about the mission. This will strain his "bairns", his beloved engines, because it takes immense energy to bulldoze the Enterprise through the continuum of time and space. That is why they have to make a pit-stop in 1901 at the house of English author H.G. Wells who has secreted away a Time Machine in his basement which is small enough to do the job of moving people around within the time continuum with less energy. One of the musicians on the list is Jean-Marie Leclair, to be brought to the future before his untimely death at the point of a knife. You can find intrigue, entertainment and humor in John's books. They make a great read, and the paperbacks are a pefect gift!